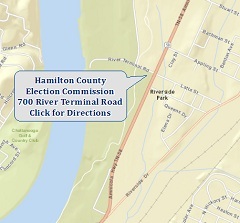 The Hamilton County Election Commission conducts all City, County, State and Federal elections held within Hamilton County. Election workers are an important part of the electoral process and we need the help of concerned citizens, just like you, to run honest elections. Democrats, Republicans and Independents are all encouraged to apply. Will I be paid to work on Election Day? Yes. As a new worker, you will attend a required training session and you will be paid $20 to attend this class. What will the hours be on Election Day? You will need to report to your assigned polling location no later than 7:00am (an hour before the polls open on Election Day). You are required to stay at the polling place until the polls close at 8:00pm and all of the election equipment has been properly stored. You should bring food, beverages and any medications you are required to take for the day. You may also bring a book or magazines. You must be a registered voter in Hamilton County OR at least 17 years old and a resident of Hamilton County. You must be willing to commit to work the full 14 hours on Election Day. You must be able to understand and follow written directions. You must be willing to attend the training session before each election. You will be cross-trained and expected to perform multiple jobs. Government employees (Federal, State, County or Municipal) cannot be election officials, TCA §2-1-112. School teachers and employees of higher education may work. While there is no law against it, close relatives of candidates on the ballot will not be hired. A) If you have an email address, please complete our online application below for faster service. B) If you prefer you can print out the application below and send it to our office by mail.